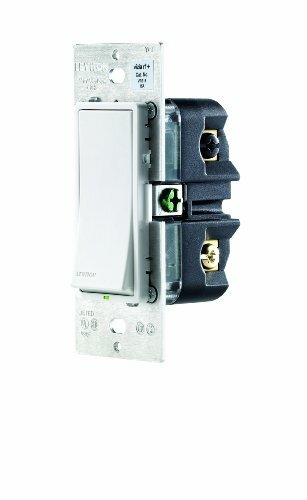 The Vizia RF + Split Duplex Receptacle from Leviton fits into a standard wall box and replaces a regular receptacle where a neutral is present. The top outlet provides local and remote on/off switching of table lamps, floor lamps, holiday lighting, fans and more. It responds to commands sent from a Leviton Vizia RF + Controller or other Z-Wave-compatible controllers or programmers. Controlled devices react through scene commands individually or as part of a scene or zone grouping of lights to provide an elegant and convenient 1-touch lighting experience. The bottom outlet is a standard tamper-resistant receptical that provides constant power. Both outlets contain an internal shutter mechanism that blocks access to the contacts unless a 2-prong plug is inserted helping ensure that hairpins or other objects are not inserted.